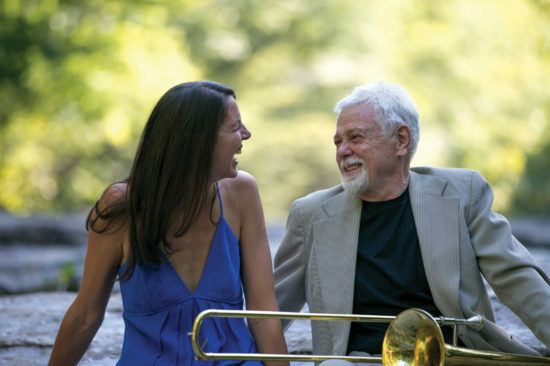 Roswell Rudd and I met in Saint Paul, Minn., in 2009, when we were both guests on A Prairie Home Companion. The magic began that day, as we uncovered the many serendipitous connections we had, the foremost being that we lived 8 miles down the road from each other in the backwoods of the Catskill Mountains. Taking advantage of our newfound neighbor status, we started getting together to play music about once a week. Roswell lived with his partner, Verna Gillis, on a beautiful property in the woods of Kerhonkson, N.Y. Sculptures by Verna’s late husband, Bradford Graves, line the yard and the edges of the forest. Often when I’d step out of my car, I’d hear the billowing, soulful sounds of the trombone echoing through the meadow and bouncing off the trees in the pine forest. Roswell would be out in the yard, playing music with the day around him. He was part of the wildlife in Kerhonkson, and nature was one of his biggest collaborators. He would step out onto the patio, his eyes sparkling as he looked out toward the bird feeders or up at the sky, and sigh a breath of pure appreciation for the life around him. He would start moving his hands or body to the rhythms of the wind rustling the leaves, the crickets chirping or the peepers in the pond. He knew the wonder and magic of the world around him so intimately. Roswell moved through the world like he moved through his music. He had a way of not just being present in a moment but actively becoming a part of it—taking a journey through a song, or living among a few notes for a while. He could find out what a landscape sounded like, but more important, he could discover what it felt like. Messing around with sounds and rhythms. Knowing the spirit of sound and uncovering its mystery. He showed me so many parts of my voice and musical consciousness that had been asleep. He opened the doors for so many, and I am so grateful for his light and love. His joyful perspective on life was contagious, and there was no one more soulful and gracious than the Incredible Honk. I was able to spend some time with Roswell during his last few weeks here. I sang to him and held his hand. At my last visit, he looked deep into my eyes and said, “It never ends and I am happy about that.” Roswell Rudd will always be alive in our hearts and ears. Thank you for your wisdom, your living, breathing song and your unending spirit. We hear it and feel it and it brings us closer to the beauty and mystery of the world.